If you’ve reached that stage in an astronomer’s life where you feel the need to erect a peculiar-looking dome in your garden, then David Arditti’s book is for you. It covers everything you need to know to set up that most sought-after of astronomical posessions: the observatory.Various designs and building methods are detailed and the advantages (or otherwise) made clear. Case studies of private observatories are particularly enlightening in this respect. There are also tips on how to keep your equipment in first-class condition once it’s in its new home. For instance, how to clean lenses and mirrors with distilled water and alcohol. A handy section deals with building regulations. You might not know that planning permission is required if the roof of the observatory is over 3 metres high, for example. In short, this could be an invaluable reference source. It is a decade since Springer published two books in the Patrick Moore´s Practical Astronomy series on small astronomical observatories, and this effectively completes the trilogy. The book, by BAA member David Arditti, is better organised than previous efforts, and the consistent writing style of a single author is to be welcomed. It covers various telescopes and mounts available to the amateur, types of observatory both run-off and domed, and their siting within the owners´ gardens. Chapters 5-8 describe basic construction techniques e.g. the use of hand and power tools, building piers both concrete and brick, woodworking joints, finishing, and organising the observatory´s use. It concludes with aspects of comfort like observing chairs and warm rooms for remote observing. The remaining half of the book covers case-studies of nine observers where the author explains the build of some unique observatories. The options prove many and varied in both rural and town locations. They include a converted garage with run-off roof near a busy truck road, a run-off plastic garden shed, and tracked telescope run-off from a shed! In proving their popularity there are a further two run-off shed designs and another run-off roof design including the author´s. There are two fibreglass domes in the 3m-3.6m class – the former a professionally manufactured kit with multi-instrumentation and every conceivable luxury including air-conditioning to cope with a severe Maryland climate; the latter a more modest but nevertheless equally impressive home-built observatory in the Chiltern Hills. The section concludes with some unconventional options: a horizontal home-built solar telescope and spectrohelioscope within a light-tight shed, fed with sunlight from an externally piered heliostat mirror mounted on a stripped-down Meade LX200 mount; a hinge-aside compact shed for remotely controlled photometry; and a very compact sentry-box style enclosure for a large Dobsonian telescope. Many of the observatories covered show the owners´ instrumentation, captured images, and future aspirations for alternative telescopes and new observational targets. The final chapter provides some useful information for maintaining the observatory and telescope in good condition, including polar alignment, collimation and cleaning of optics and keeping dew etc. at bay. The appendix has observatory manufacturers and some useful weblinks. Except for a better quality semi-glossy paper, Springer´s layout and graphic style for this series is a little dated now in its second decade. The exclusively monochrome illustrations continue to lack contrast. A positive bonus of this volume is the author´s writing style that makes for very easy reading, with some complex concepts well conveyed without the use of diagrams – quite a feat in itself. 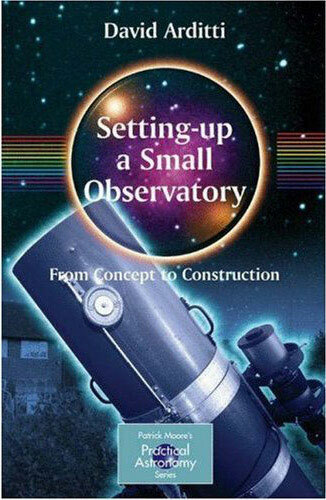 This is a comprehensive overview of all the options and considerations needed for a permanent observatory, and any observer considering building one should consult this book.